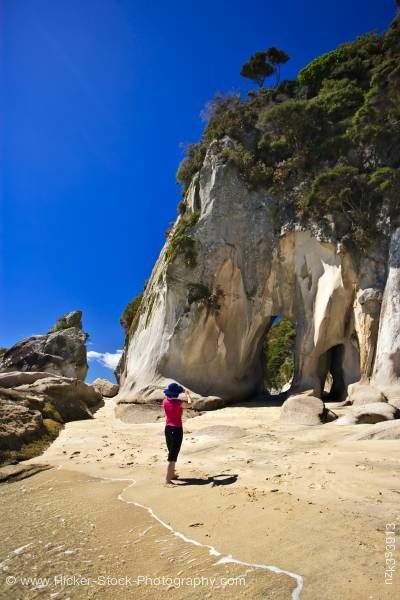 Stock photo of Arch Point, Abel Tasman National Park, Tasman District, South Island, New Zealand. A young woman looks upon the rocky ledge of Arch Point in Abel Tasman National Park. This stock photo shows the rocky ledges of Arch Point, Abel Tasman National Park, Tasman District, South Island, New Zealand. During a beautiful sunny day along the sandy beach in the Abel Tasman National Park, a young woman looks upon the rocky ledge of Arch Point. Two arches can be seen from the sandy shore. One of the openings shows through the chalky ledge to a view of the trees in the distance. Trees grow within the crevices of the rocky ledge of Arch Point. The water’s light foamy tide comes in low on the sandy shore just behind where the woman is standing. Large jagged rocks sit along the sandy shoreline. Between the rocks, a small puff of clouds sit low in the horizon of the bright blue sky.